Ferit Cemal was born in 1873 in Mersin. In order to avoid confusion with Cemal Paşa of the CUP triumvirate, he is usually referred to as Mersinli Cemal Pasha. After graduating from the War Academy in 1898, he took posts at the General Staff and the Second Army. During the Balkan Wars, he served as the chief of staff of the Western Army, and also as the commander of 10th and 42nd Divisions. In April 1914, he was appointed as the commander of VIII Corps and soon after this appointment he was made a general. 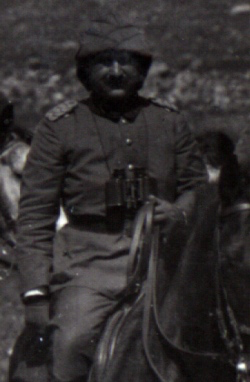 For most of the First World War, Cemal Pasha was with this unit. In February 1918, he was appointed as the commander of the Fourth Army and until the end of the war he contributed to the war efforts in the Middle Eastern theatre of war, together with Cevat Pasha and Mustafa Kemal Pasha. In October 1919, Mersinli Cemal Pasha became the Minister of War in the government formed by Ali Rıza Pasha. He was symphatetic towards the national struggle in Anatolia and intending to supply the forces of Mustafa Kemal with arms. However, he stayed in the office only for a couple of months. He resigned on January 21, 1920, due to the pressure from the Allied powers, and two months later he was sent to exile by the British to Malta. Mersinli Cemal Pasha returned to Turkey in 1921 and joined the Parliament in Ankara as a deputy from the province of Isparta. In 1926, he was brought to trial due to an alleged part in the assasination plot against Mustafa Kemal. He was not found guilty. Mersinli Cemal Pasha passed away in 1941.